The name was changed to Severance Hospital after the hospital received a large financial donation from the Severance family, who also contributed the money to build the Severance Hall in downtown Cleveland. It’s a small world! The hospital was rebuilt and opened in 2005, with a children’s hospital in 2006. The hospital slogan is “The First and the Best,” which expresses its goal of maintaining a reputation for excellence. 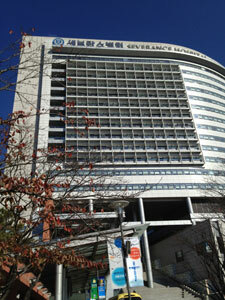 Severance Hospital was the first modern hospital in Korea and is ranked among the best hospitals in the world. The hospital has had many accomplishments. Korea’s first heart transplant surgery and cochlear implant surgery were performed at Severance Hospital. The largest number of kidney transplant surgeries and cerebrovascular surgeries in Korea are also performed at Severance Hospital. In 2005, it was the first hospital in Asia to introduce the “da Vinci” robotic surgery system. We had a wonderful tour of the hospital, which is beautiful and very appealing. Visually, it is bright and open with nature and art incorporated into its design. The light scent of flowers and fresh air was abundant. Soft music is heard and frequent concerts are offered in the atrium areas. The hospital uses an electronic medical record system. Everyone gets a card that looks like a credit card to access not only their medical record, but their appointment times, care instructions, and prescriptions. Our tour included an unusual request. We were curious to see the hospital morgue. Our tour guide was a bit surprised and shared that she had never been there before. Ae Ran Hwang made a call and security met us and let us in. In South Korea, there are no funeral homes and there are no autopsies. When people die, their bodies are prepared and stored in the morgue, where families have the opportunity to watch and participate in ceremonial bathing. Their families have access to a special room where they stay close by for 3 days for adults and 2 days for children. The room includes sleeping and eating accommodations as well as an altar where the deceased person’s photo is displayed along with flowers and offerings. There is no embalming. A person has the choice of burial or cremation, but almost all choose cremation. 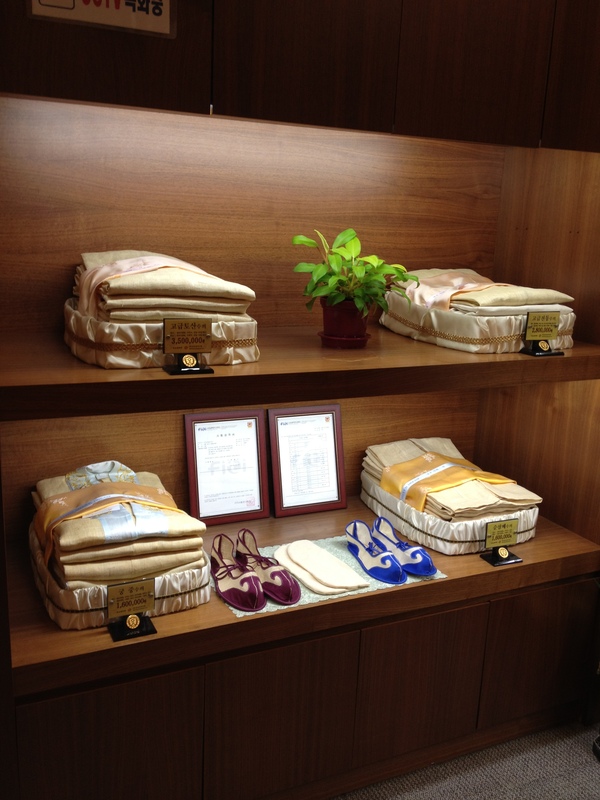 There are special traditional clothes and shoes that the body is dressed in, which are sold, along with coffins and urns, in an area of the hospital lobby near the “funeral pavilion.” Family and friends are invited to view them and conduct a funeral service on the last day, before the body is transported to the burial ground for an additional service. All of these expenses are then included in the final hospital bill. Unfortunately, when a child dies in Korea, that is seen as a negative thing and parents are looked down on. Needless to say, this makes bereavement more complicated and difficult for parents. Because of this, parents don’t share the death with friends and relatives, as they do with the death of an adult. Ae Ran Hwang is trying to change that. She has been counseling parents to help them deal with the death of their child in healthier ways in order to support closure and less complicated grieving. She brought us here to South Korea to teach the staff about the importance of pediatric palliative care. It is particularly noteworthy that a bereaved parent will be speaking at the main conference on Saturday, as that takes great courage and represents major culture change.